Byrne, Eugene, and Kim Newman. Back in the USSA . Ziesing 1997. What if: US labor relations went quickly downhill in the early 20th century, with a massacre of Chicago hunger marchers in 1905 and the assassination of president-elect Theodore Roosevelt in 1912 when he attempted to break up a Chicago labor strike before the inauguration. Series note: Collection of the related stories "Ten Days that Shook the World", "Tom Joad", "Citizen Ed", "In the Air", "Teddy Bear's Picnic", "Abdication Street", and "On the Road". All but the last were previously and originally published as by Newman and Byrne. Newman, Kim, and Eugene Byrne. "Ten Days That Shook the World"
Summary: How reaction to the anti-socialist backlash caused by Roosevelt's assassination, early entry in World War I, and the corrupt presidency of plutocrat Charles Foster Kane caused a socialist revolution led by Eugene Debs. Series note: A Back in the USSA story. Published: In Interzone #48 (June 1991); Aboriginal #27 (Jul/August 1991); and Byrne and Newman's Back in the USSA , q.v. Translation: Spanish by León Arsenal as "Diez días que estremecieron al mundo", in Gigamesh #14 (May 1988). Newman, Kim, and Eugene Byrne. "Tom Joad"
Summary: Ideology agents Elliott Ness and Melvyn Purvis hunt for a legendary agitator and end up confronting Chairman Capone's enforcer Frank Nitti. Published: In Interzone #65 (November 1992); and Byrne and Newman's Back in the USSA , q.v. Newman, Kim, and Eugene Byrne. "Citizen Ed"
Summary: The alternative life of a serial killer, told as the struggle between an upright deputy sheriff and a party-member, necrophiliac, cannibalistic butcher. Published: In Interzone #113 (November 1996); and Byrne and Newman's Back in the USSA , q.v. Translation: French as "Citizen Ed", in CyberDreams 12: Destins paralèglles (ed. Francis Valéry), DLM 1998 (287795119X). Awards: Nominee: 1997 British Fantasy Award for best short story. Newman, Kim, and Eugene Byrne. "In the Air"
Summary: Musician Charlie Holley recounts how barnstorming cropdusters Howie Hughes and Jack Kerouac crashed a Kansas collective's party in honor of the Revolutionary Fraternity Squadron. Published: In Interzone #43 (January 1991); and Byrne and Newman's Back in the USSA , q.v. Newman, Kim, and Eugene Byrne. "Teddy Bears' Picnic"
Summary: A soldier's story of the 1960s war in Indo-China, as Britain and Russia try to prop up the southern government in the face of the USSA-supported north. The story becomes a movie questioning Britain's role in the war. Published: In Interzone #122, #123 (August, September 1997); Byrne and Newman's Back in the USSA , q.v. and Newman's Unforgivable Stories Pocket UK 2000 (0671022210). Awards: Finalist: 1997 Sidewise Award for best short-form alternate history. Newman, Kim, and Eugene Byrne. "Abdication Street"
Summary: In capitalist Russia to marry the tsar's daughter, Britain's Prince Charles falls in love with a television make-up girl. Published: In Interzone #105 (March 1996); and Byrne and Newman's Back in the USSA , q.v. Awards: Honorable mention: 1996 Sidewise Award for best short-form alternate history. Byrne, Eugene, and Kim Newman. "On the Road"
Summary: A decade after the collapse of the USSA, a British reporter accompanies Robert Maxwell's capitalist Roadshow along Route 66 across America. 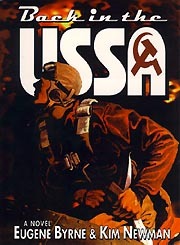 Published: In Back in the USSA , q.v.